Property 31: Hossegor central beach, beautiful studio any comfort classified ocean. 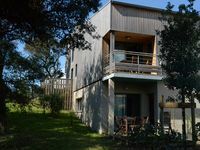 A Hossegor (Landes) Independent villa between Ocean and Marine Lake. Property 40: A Hossegor (Landes) Independent villa between Ocean and Marine Lake. We had a great time and beautiful weather. The studio is well equipped and nicely decorated. And of course, perfect location right on the ocean!